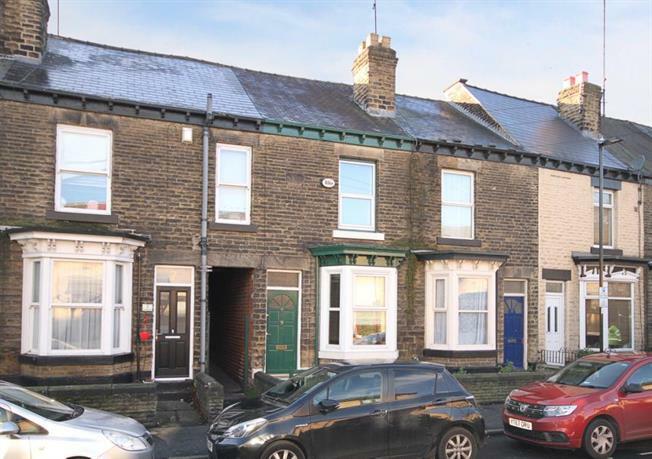 An excellent opportunity to acquire with no chain this beautifully presented, Victorian three double bedroomed terraced home located in the heart of highly convenient Hillsborough. Offering spacious accommodation over three levels with the benefit of double glazing, GCH, over passage accommodation on the first floor, fitted offshot kitchen, forecourt and rear garden. The property has been upgraded by the current owners, and must be viewed. The accommodation comprises a bay windowed lounge to the front with wooden flooring and polished cast iron fireplace focal point. An inner lobby has carpeted staircase to the first floor landing. The dining room is carpeted with window to the rear and cellar head access with built in cupboards and decorative fireplace surround. The offshot kitchen has a range of base and wall units in a modern shaker style with work surfacing, inset sink, point for oven with extractor, plumbing for washing machine, tiled splash backs, rear access door and windows to side and rear offering lots of natural light. On the first floor, Bedroom one is carpeted with window to front, decorative fireplace surround and useful built in cupboard. Double Bedroom two is carpeted with rear window and built in wardrobe. The Bathroom has three piece suite in white comprising WC, wash basin and bath with shower over, tiled splash backs and flooring, Victorian style radiator/towel rail and rear window. A further staircase rises into Attic Bedroom three with carpeting, dormer style rear window and an excellent range of built in wardrobes providing storage. To the exterior of the property is walled forecourt to the front and to the rear a garden area providing an outdoor seating and entertaining area. An early viewing is recommended to appreciate the size and standard of accommodation on offer.